Honored in 1913 and in 1924 as the American League's Most Valuable Player, Johnson retired from playing baseball in 1927. Two years later, he took over as manager of the Senators until 1932. 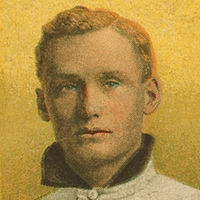 He was among the first players to be elected to the National Baseball Hall of Fame. The "Five Immortals" first chosen for the honor were Ty Cobb, Christy Mathewson, Babe Ruth, Honus Wagner, and "The Big Train" Walter Johnson. So, how's your fastball?